This book is not intended as a comprehensive study. It gives some basic information about the 72 scales (melakartas) that are the parent scales from which all ragas are formed, the Tala: a highly developed rhythmic system, exercises, tunes, and a list of suggested recordings. 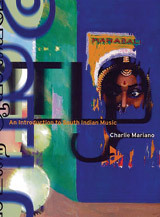 Titles include: Introduction * Melakartas * TALA-Rhythm * Notation * Exercises * Songs * Suggested Recordings * About the Author.